“We are seeing lenders impacted to the tune of 20-30 bps on profitability when they are not pricing the file/funding/admin fee into the UPFRONT best ex. From our conversations with lenders, this appears industry-wide. With the plethora of new investors entering the market, the so-called 'File,' 'Funding,' or 'Admin' fees charged by some investors on the transfer of loans have become a much more significant factor in determining the best all-in price. These fees can range pretty dramatically from investor to investor, but some of the newer correspondent channels are charging 2 to 3 times the fees of other established investors. While most lenders and all MCT clients include investor file fees in the best ex prior to committing a loan, MCT has discovered that many lenders do NOT take the File/Funding/Admin fees into consideration with investor best effort pricing on the front end. This oversight can lead to hidden profit leakage/cost that even the most disciplined of correspondent sellers may miss." These granular fees affect the lenders profitability if the PPE they’re using can’t support them. 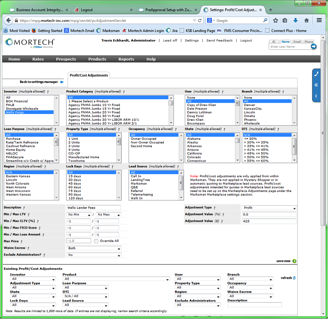 While some PPE’s on the market are unable to support granular lender fees, Mortech’s PPE Marksman is one of the few that does offer the ability to upload and report the file, funding, and admin. fees of lenders upfront, and can be set up a couple of different ways in the system. They can be added directly to the profit tables for individual investors or can be put in even more granular if needed, as a “profit and cost” adjustment. Profit and Cost adjustments can be broken down by investor, loan size, loan purpose, occupancy, and even to individual products, among many more. This granularity allows Marksman to cover these costs and price them into the upfront best ex price.